Grand wedding exits have been a cherished addition to wedding ceremonies for hundreds of years. There have been many different ways of conducting wedding exits from involving your wedding guests and adding certain wedding favors. Over the years traditions have changed from flowers, rice, confetti poppers and now wedding sparklers. Sparklers have been a part of many holidays and celebrations throughout the year and now they get are showcased at the end of the wedding night. At Grand Wedding Exit we are happy to supply our wedding community with sparklers made especially for weddings. Our wedding sparkler comes in multiple sizes and shapes to help fit the ideal wedding size. True wedding sparklers are durable, yet sparkle brightly and can be mixed and matched with various quantities. 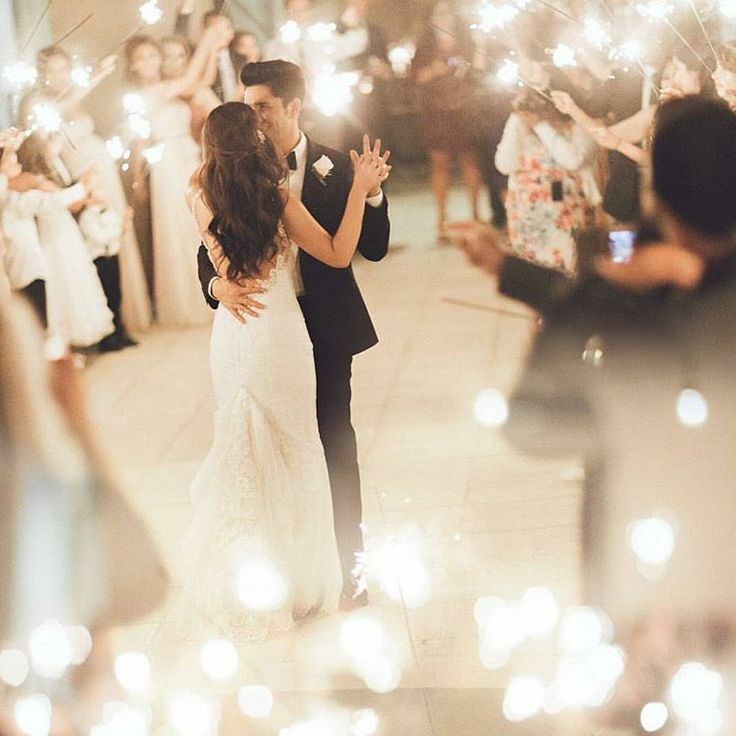 Wedding sparklers from Grand Wedding Exit can be shipped worldwide and have a variety of shipping options to ensure we make it in time for your wedding day! 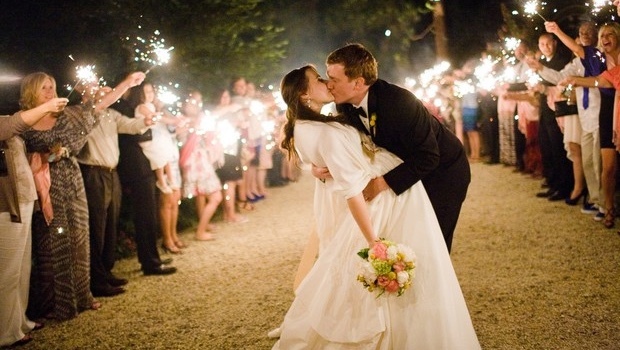 So how did we end up with sparklers becoming the most popular way to exit your wedding night? We owe thanks to our wonderful wedding photographers. Back in the early 2000's wedding sparkler exits became extremely popular as photographers were finding out how amazing these photo's came out. With wedding sparkler exits taking between two to three minutes, it gave them ample time to take tons of pictures as the newlyweds slowly exited and posed for kisses in the middle! Brides quickly found out how amazing they turned out and in majority of the cases it ended up being one of the best photo's of their entire wedding night! Suddenly throwing rice seemed old school and a thing of the past. It even quickly overcame using confetti cannons! A lot of people still turn to confetti cannons or poppers if their venue does not allow the use of wedding sparklers. However, over the past five years majority of venues now allow the use of a true wedding sparkler. They have quickly realized how popular these wedding exits have become and do not want to miss out on booking another wedding. Most of the time they create a dedicated area thats safe for you to perform a sparkler exit. We still highly advise you to speak to your venue or have your wedding planner ensure you can partake in a sparkling exit. Our wedding sparklers come in three popular wedding exit sizes. Our 36 inch sparklers burn for about 3.5 to 4 minutes. These are superior sparklers for your fairy-tale exit one last time in front of your wedding party. Our 20 wedding sparklers burn for about 2.5 to 3 minutes, which is the perfect amount for medium sized weddings. Lastly, our 10 inch sparklers burn for about 1 minute and create the ideal moments for first dances and wedding toasts. We also supply custom heart shaped sparklers that are hand crafted and hold a burn time for 2.5 to 3 minutes. Another popular product we offer at Grand Wedding Exit happen to be our cake sparklers which sparkle for about 1.5 minutes and can make your cutting the cake moment one to remember! Our wedding sparklers come in preset quantities that are perfectly crafted for various wedding party sizes. These sparkler variations were acquired by research from wedding and event planners nationwide. Our smallest package of wedding sparklers is 48. 48 wedding sparklers are ideal for small intimate weddings that have simple and quick wedding exits. 96 wedding sparklers are the average order sizes for weddings of 80-120 guests. This allows the customers to have an economical amount of sparklers at their event. 144 sparklers are commonly purchased for larger events that wish to include guests to join in on photo shoots and grand wedding exits. 288 is the ultimate package of wedding sparklers. This make it possible to have several attempts at a grand wedding exit. You can also have multiple photo shoots and use sparklers for engagement photos, invitations, thanks you cards and wedding favors. With the different sizes available you can mix and match quantity with size to create the most personalized sparkler package. We consider our large package of 288 sparklers as our wholesale sparkler amount and is offered with the best discount. We can guarantee that adding sparks of entertainment may be one of the least expensive items of your wedding night, yet the most memorable! In addition to the true wedding sparklers offered to our customers, we now offer sky lanterns. Sky Lanterns can be the finishing touch to any event. With various sizes, shapes, and colors, sky lanterns offer that extra glow to the night. Wedding Sky Lanterns that are the most popular are the Original Shaped White Sky Lanterns. These Wedding lanterns are 17 inches by 17 inches by 28 inches in measurements. When released properly, these wedding sky lanterns float in to the sky for about 10 minutes. All of our Wedding Sky Lanterns are 100% Eco friendly and biodegradable. So here at Grand Wedding Exit we aim to do the very best we can for both our client and community. We continually stride to find the newest and hottest ways to send off your wedding. Our goal is to make your wedding night unique and truly one to remember!